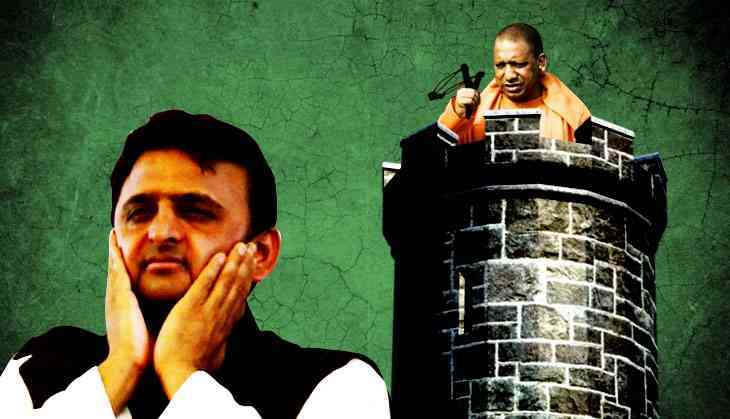 The Yogi Adityanath government seems to be going hammer and tongs after Akhilesh Yadav's pet projects, looking for corruption and trying to sniff out the beneficiaries of the loot. Questioning Akhilesh's decisions is also a part of the exercise. The former chief minister’s dream project, the Lucknow-Agra Expressway was the first to come under Yogi's lens, followed by the cycle tracks and now the Yash Bharti awards. When the land acquisition began for the Rs 1,500 crore, 302 kilometre long expressway, there were murmurs about officers and netas making money in the project. Yet there was not a single instance of protest from those the land was acquired from. On the contrary, the government and the IAS officer heading the project were extolled for their land acquisition model. It was alleged that interested parties had purchased the land along the expressway at cheaper rates before the project was announced and later made a quick buck by selling it to the government at four times the market rate. In at least one district the district magistrate was said to have increased the circle rate, the price of land fixed by the government, and lowered it immediately after the land was acquired for the country’s first green field project. With 2,000 hectares of land in 232 villages having been acquired for the project, somebody must have made hundreds of crores if the allegations turn out to be true. The new BJP government has ordered that the registries of all the land acquired for the project must be revisited and has sought detailed information from the district magistrates of Lucknow, Agra, Firozabad, Mainpuri, Etawah, Auraiya, Kannauj, Kanpur Nagar, Unnao and Hardoi – all the places through which the expressway passes. The information required to be furnished includes who owned the land one year before it was acquired, and if it was sold to someone in that period, then who purchased it. While the DMs will be looking into the land deals, the government agency RITES will inquire into the cost and quality factors. The allegation of land use being changed fraudulently surfaced after government officials asked the residents of Nagla Chitey in Bachhela Bachheli village of Firozabad to return the compensation paid to them. The land was purchased from them at rates varying from Rs 800-Rs 8,000 per square metre as it came under the abadi (habitation) category. Just as the rich villagers started spending the money, the Firozabad district administration served recovery notices to 22 villagers claiming they were paid compensation which was up to three times higher than the rate fixed. The villagers approached the Allahabad High Court where the government stated that “consolidation department staff had colluded” with the villagers to notify the land as “abadi”. Luckily for the villagers, the high court dismissed the government’s plea and quashed the recovery notice. The other decision of the previous government which raised eyebrows even earlier was the giving away of the Yash Bharti awards mindlessly. The most talked about instances are those of the lady compering the award presentation ceremony sending a chit to Akhilesh Yadav who immediately asked her name to be included in the list. A village pradhan, a pujari associated with the Akhilesh family were the other beneficiaries. Bharatiya Janata Party’s Narendra Rana was also a recipient. Four award presentation ceremonies were held in 2016 to give the Yash Bharti to 131 people. It seemed that there were no criteria to select the awardees and even the numbers were not fixed. When the Culture Department’s budget fell short, it borrowed money from the Lucknow Development Authority for giving away the prize money and pension. The Samajwadi Party is so far unperturbed. Akhilesh Yadav’s confidante Anand Bhadauria said it was not surprising that the new government has got into a witch-hunt mode. “Sensationalising issues must be giving them thrills but let them do what they are doing…as if they are all very clean. We will not react,” he said. Bhadauria said that it was the government’s honeymoon period and they would give it six months. “But one should still ask if it has done anything at the ground level,” he added.